Destination Addiction: Is this you? Ever wonder where happiness really is? Confessions of a Destination Addict. There I was, in the middle of a day-long silent meditation retreat, wondering what tomorrow would be like, and the next day, and the next day. In fact, in a span of 35 minutes, I had planned the next 2 years of my life: perform at Dancing with the Stars, launch a new program at work, read more books, get a dog or two, and definitely visit my sister in Prague next year. Oh, Prague. Can. Not. Wait. Then, I was abruptly taken out of my dream world by the sound of the bell; and I realized I was supposed to be meditating. Sigh. Boom. This was me. In that moment I realized for the first time, even though I’ve been meditating for years, that I’m constantly looking for happiness in the next place, the next event, the next day, the next moment. Anywhere but here in this moment. How many moments of my life did I miss because I wasn’t fully present? How many days, months, years did I miss because I was always looking for the next best thing? Sadly, probably too many to count. But I was glad that our meditation teacher guided us through a powerful journey to let go of the hope for a better past. I really needed this, it was time to let go and start anew. During that meditation retreat it finally dawned on me that there will never be a better time than now. Conceptually, I’ve known this for years. And if you’re familiar with the Power of Now by Eckhart Tolle, you know what I mean. ‘Yeah, I totally get it’ you said after you read the book, but then next thing you know you’re off into La La Land making plans for the future and wishing you were there not here. It wasn’t until that day, in the middle of silence, that I felt it at a visceral level. There will never be a better time than this present moment. This is it. This is my life. To my surprise, the next day I actually felt freer, somehow liberated. I felt free to choose a different way to relate to my daily life and to the people I care about. And more importantly, I felt tremendous gratitude for all the good things I do have in my life right now. It allowed me to stop obsessing about the future, let go a bit and just allow things to happen. Let the good and the not-so-good times roll, if you will. The Highlight of the meditation retreat? Not having my phone with me! In fact, Geeta, our teacher, asked us to leave it in our car and have it turned off. Not having to check my phone every 15 minutes and not knowing the time of day (there were no clocks anywhere in the retreat area) was surprisingly freeing. And since we couldn’t read or journal either, it gave me the opportunity to be more present in the absence of the constant urgency to be somewhere or do something. Have you ever felt that real happiness will come at a later time in your life? What if it was here with you right this moment? 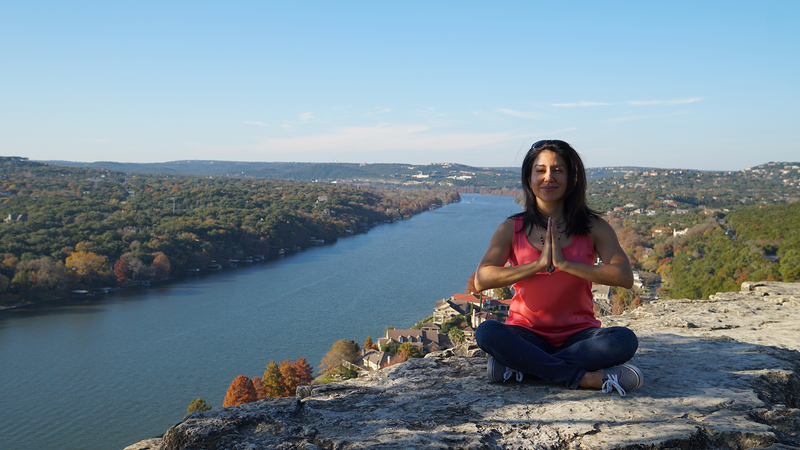 A native of Mexico, Azucena moved to the States to study Computer Sciences and swim for the University of Texas at Austin. She later pursued a professional career in Latin dance and has won Dancing with the Stars in Austin in 2017 and third place at the World Salsa Championships in Puerto Rico in 2008, among others. Currently, she works in Marketing at a tech company in Austin, Texas and enjoys writing about personal growth and mindfulness. Slow Down To Do More, “From Medical School to Food Addiction to Spiritual Author” with Ashley Graber and Bracha Goetz.